FILE - Syrian civil defense workers rescue a man from under the rubble after a Syrian government helicopter allegedly dropped a barrel bomb on the Sakhour eastern neighborhood, in the northern city of Aleppo, July 25, 2014. For weeks Ankara and Washington have been discussing establishing a safe haven in northern Syria to shield civilians and rebels alike from relentless Syrian government airstrikes. But with advanced Russian combat warplanes now present in the country all bets are off whether a such a zone will be established at all, analysts say. Without a safe haven there are likely to be further surges of refugees fleeing into Turkey and Europe. Struggling to cope with an estimated 2 million Syrian refugees, Turkey has long campaigned for a “no-fly zone” in northern Syria to stem the tide of displaced civilians trying to escape the four-year-long civil tearing its southern neighbor apart. More than 250,000 have died so far in a war that seems set to continue for some time. 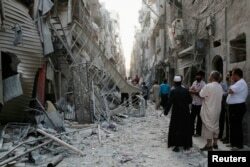 FILE - People stand near damaged buildings along a street at a site hit by what activists said was a barrel bomb dropped by forces loyal to Syria's President Bashar al-Assad in Aleppo's Bustan al-Qasr neighborhood May 28, 2014. In July, it appeared Ankara had overcome objections by the Obama administration, which has feared being drawn into the Syrian civil war, in trying to set up some kind of buffer zone. U.S. and Turkish officials agreed in broad terms to establish a protected zone, but Washington envisaged the planned zone as one free only of Islamic State extremists and not as a fully fledged safe haven as called for by the Turkish government and Syrian opposition leaders. With Russia engaged in a military buildup in Syria to shore up the regime of President Bashar al-Assad doubts are growing about whether a buffer zone will in fact be established. “All bets are off for any and all parties that had hoped for measures to restrain Assad's slaughter in Syria,” said Jonathan Schanzer, a Mideast expert at the Foundation for Defense of Democracies, a Washington-based think tank. “This includes the Turks, who had hoped for a safe zone. With Russian warplanes in the sky and other assets on the ground, Assad has insurance he has not had since the war broke out. Assad's adversaries will now have to wait for [Russian President] Vladimir Putin to spell out the new rules of the game," Schanzer added. One of the concerns with policing a buffer zone is how mishaps or clashes can be avoided between U.S.-led coalition fighter jets and those of the Syrian or Russian air forces, says a NATO official, who talked to VOA on the condition of anonymity. “The airspace is limited and the coalition has very different objectives from those of the Syrian government or Moscow." 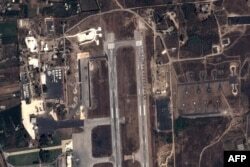 FILE - This handout image taken by EADS' Astrium Press on September 20, 2015, by Pleiades Satellite purports to show a view of Russian fighter jets and helicopters at a military base in Latakia, Syria. Putin has said his objective in Syria is to help battle Islamic State extremists, but Syrian rebels and Western officials fear Moscow’s real purpose is to shore up Assad and possibly to strike at rebel fighters seeking to topple the Syrian leader, a longtime Russian ally. Turkey’s Prime Minister Ahmet Davutoglu told journalists in New York this week that the international community needs to step up efforts to address the refugee crisis, arguing the only way to prevent major waves of refugees is to halt the violence of the Syrian regime and the Islamic State group and to create safe havens for Syrians within their country so they don’t have to flee to nearby neighbors -- Turkey, Jordan and Lebanon. On the sidelines of the U.N. General Assembly meeting this week in New York, Khaled Khoja, the president of the Western-favored Syrian National Coalition, an umbrella opposition group, met with various world leaders to press for the establishment of safe havens and a no-fly zone for Assad’s warplanes. Rebels and international rights groups say Assad’s warplanes target residential areas and markets to maximize civilian casualties. In his meetings with leaders, Khoja also said that a safe zone will help save the lives of 200 civilians a week and will slow the flow of refugees. It will also help fight extremists more effectively and will increase the chances of achieving an orderly political transition,” according to a statement from the Syrian National Coalition. The safe haven proposal has been fraught with difficulties since U.S. and Turkish officials started to discuss it in earnest with a settled agreement between Ankara and Washington proving elusive. In the meantime, Islamic State extremists have complicated the challenges by intensifying an offensive on a group of towns and villages at the heart of the prospective buffer zone, posing a new set of challenges about how to secure the buffer zone from ground attacks by Islamic militants, analysts said. 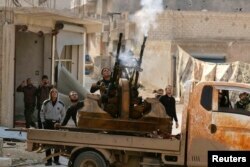 FILE - Free Syrian Army fighters fire an anti-aircraft weapon towards forces loyal to Syria's President Bashar al-Assad in the Handarat area, north of Aleppo, Nov. 30, 2014. The fighting to the north of the Syrian city of Aleppo illustrates how complex and tangled the Syrian civil war has become, featuring a dizzying array of rebel factions. Some are approved of by the West while others are favored by Turkey and the Gulf countries, and two rival jihadist organizations – not to mention the Kurds and Syrian government forces. While coalition airstrikes are targeting Islamic State extremists, regime warplanes have been pounding villages controlled by rebel factions and, according to insurgent commanders, chiefly those that are important for rebel supply lines into Aleppo. U.S. and Turkish officials concede there is no agreement between them about which rebel militias they are prepared to collaborate with to enforce the zone on the ground. Ankara wants to include Islamist militias that Washington has shunned in the past, including Ahrar al-Sham, a close ally of al-Qaida affiliate Jabhat al-Nusra. Turkey has been pushing Washington to rely on Islamist militias for ground protection. The collapse of the U.S. train-and-equip program for a rebel force that can partner with the international coalition against the Islamic State group has added doubt to the establishment of a safe haven – at least for the time being, U.S. officials said. However, in meetings with Western and Mideast allies this week in New York, French leaders have been pushing hard for a safe haven.